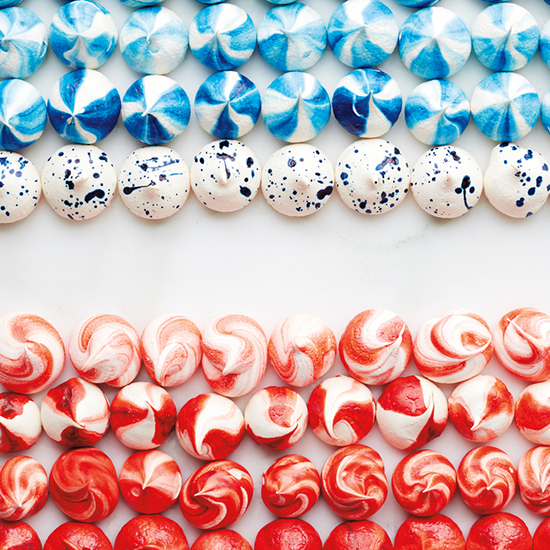 Bring even more fireworks to your July Fourth festivities with this sweet treat, where you can channel your inner artist by applying exuberant color to this white cookie. Work with gel coloring instead of standard liquid food coloring here because the hues are supersaturated and the consistency is paintable. But remember, an apron and gloves are a necessity. Read on for the yummy recipe, and scroll down for buying info on the groovy props shown. 2. Line two baking sheets with foil. In a stand mixer fitted with a whisk, beat whites at low speed until foamy, then beat at high speed until firm peaks form, 2--3 minutes. With the machine on medium speed, gradually beat in sugar until incorporated, then beat in vanilla. 3. Now read the instructions below to create each painted effect before proceeding. 4. Using a disposable pastry bag ($3/10; nycake.com) fitted with a large round tip (No. 9, $1; nycake.com), pipe 11/2-inch mounds of meringue 1 inch apart onto baking sheets. 5. Bake for 1 hour and 15 minutes, rotating sheets halfway through, until cookies are firm. Cool completely before serving. 1. Dilute 1/2 tsp coloring with a bit of water. 2. Wearing gloves, dip a pastry brush into the mixture; tap over unbaked white meringues. 1. Prop a pastry bag open in a vase. Use a small paint brush to paint 3-4 lines of food coloring inside the bag, starting from the piping tip to halfway up the bag. Fill with meringue. 2. For swirls, pipe in a clockwise motion. 3. For stripes, pipe while keeping the bag still. 1. Add a few drops of food coloring with the vanilla in Step 2.